I’ve been thinking about how to carry more stuff for trips where I am staying away for a while, at a conference for example, and I need a variety of kit and different bags. I own both a touring pannier (huge capacity) and an S-Bag (good briefcase, day bag and aircraft hand luggage) so in many ways these two would make a good pair, the trouble is that they both want to fit on the front luggage block. Steve Parry has designed a modification to fit a luggage block to the rear of the Brompton but it’s an expensive addition costing more than the luggage. So I was racking my brains about a forthcoming trip and even thinking about buying something like a Carradice seatpost pack or saddlebag when I decided to look at where the S-Bag might fit at the back. 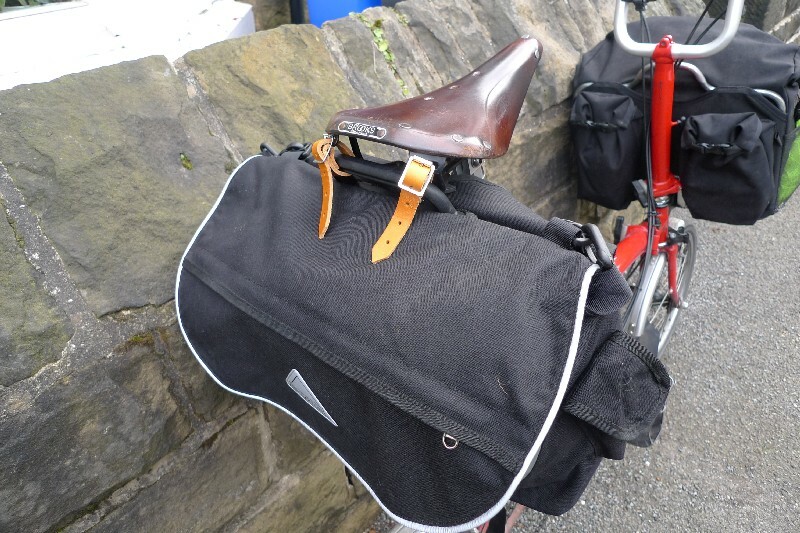 Maybe it was the fact that I’d been looking at saddlebags but the whole thing just clicked into place in my mind – the S-Bag is very similar to a large saddlebag and its carry handle lines up nicely with the bag loops on my Brooks Saddle. I tried it our with some Velcro cable-organiser straps and it worked perfectly. If you don’t have an S-Bag it’s still a good option to buy one as it’s not much more investment than a good saddlebag and gives you a lot of luggage options. 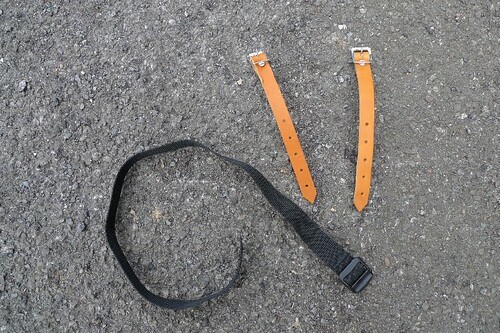 The next problem was finding some proper straps and I was thinking about various methods with Velcro or leather toeclip straps. However Carradice came up trumps with exactly the right products for £6.90. I think they deliver outside the UK. They are described by Carradice as “honey” colour. My Brooks saddle was also called “honey” so maybe these will age to match. 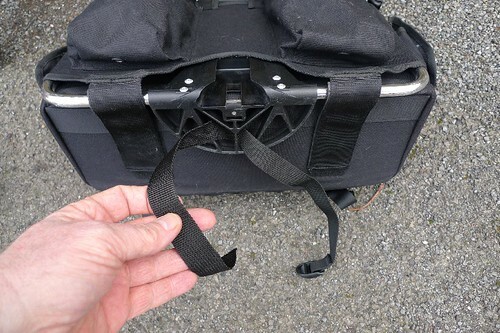 just pass the straps through the bag handle and tighten them to the smallest size, the furthest hole seems just right. 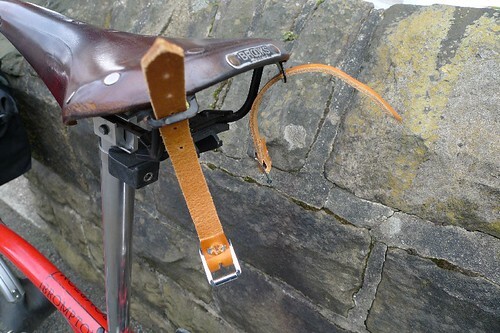 Nice retro look with the leather saddle and a bit more stylish than the Carradice bags. At a pinch you could probably get by without this but it stabilises the whole thing. If you tighten it right up you may find the bag contacting the backs of your thighs so you need to find the right length to balance fit and stability. I have it set so the bag just lightly touches my thighs, if I was doing proper touring I might want to avoid any contact. If you really need to set the bag a good way further back from the post you could probably find something to jam into the loop of strap as a spacer before tightening it. A small stuffsac with a Thermarest travel pillow might do very well. The strap needs trimming to a suitable length, a flame will seal the cut end, leave some extra because you may decide after time that it’s not quite right. 50 litres plus and a bag for all occasions, I’d be tempted to try it with the new C-Bag which is neater and a bit bigger than the S-Bag but either way don’t assume you can load up the rear bag with heavy stuff. 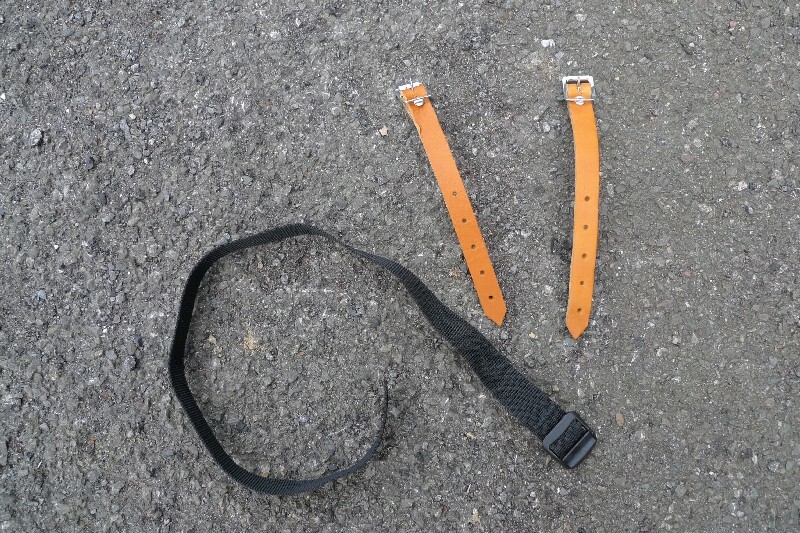 In these photos I had not fastened the S-Bag’s straps so the flap is just holding on by the Velcro and a bit untidy. I reckon you can fit and remove it in less than 30 seconds. Enjoy! This entry was posted on 7 March 2009 at 13:33 and is filed under Brompton, Luggage, Practicalities. You can follow any responses to this entry through the RSS 2.0 feed. You can skip to the end and leave a response. Pinging is currently not allowed. 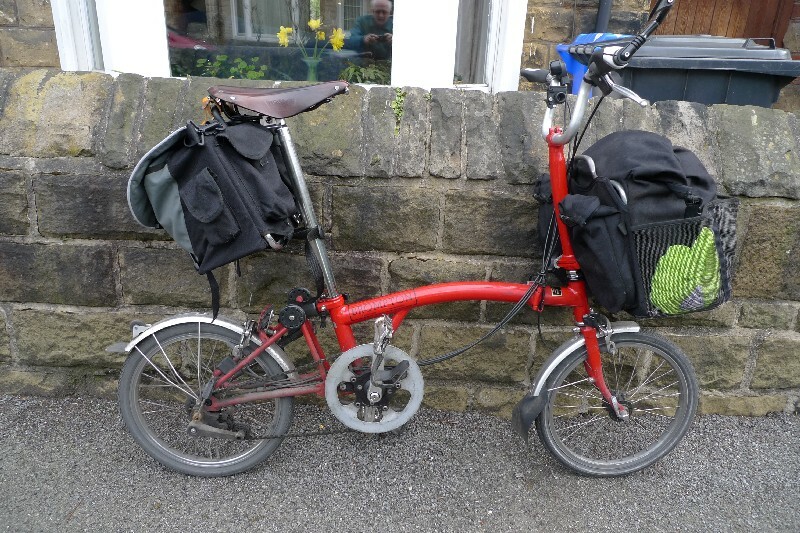 If you’re interested in carrying more by Brompton, you might want to look at a monster touring pannier sold only in Benelux. It is rated at 40 litres, compared to 28 for the touring pannier (31L for the 2010 touring pannier). They also sell a bigger rear pannier, 25 litres compared to 16 for the official Brompton version. Requires the rear rack. Nigel once posted that he can mount the rear rack in half an hour. Might be worth it for touring, especially for carrying heavy items. Interesting, I wish they would make these readily available outside Benelux but nobody seems to do online retail on those products. 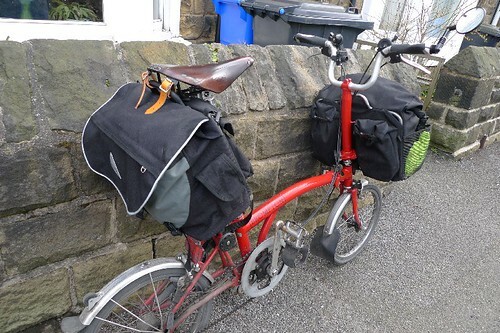 Incidentally, I suspect the new 2010 touring pannier is the same size as the old one, they probably just adjusted the calculation to be more realistic, and I bet there are people who have managed to fit 40litres in there. Thanks — I think I’ll try this. How much weight to you think you can safely carry attached to a Brooks saddle? And do you think the weight allowance would be different if using a Titanium seatpost? I’m afraid I can’t answer your question Peter. As I say in the post you have to take responsibility for your own weight, the length of the extended seatpost (a form of cantilever), and the way you use it, all in the absence of any published data. A serious case of real life intruding on theory. I’ve used it with a standard steel post slightly short of full extension and I think I may have had between 5 and 10 kilos in the bag but I really don’t know how you would work out the limits. 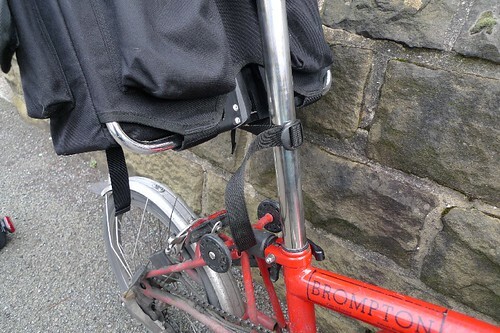 I work on the basis that much heavier people than me ride Bromptons with no problems and some of them use various kinds of saddlebag or seatpost bag..
And I don’t know how a Ti seatpost compares to the steel one in this respect. Thanks for your comments. My situation is somewhat different from yours: I have an S-bag and a T-bag, but S-type handlebars, so ideally I’d like to use the S-bag on the front attach the T-bag to the saddle, hence I’m concerned about overloading it. I think I’ll experiment with attaching the T-bag to the rear rack, and with resting the T-bag on a rear rack sack for even greater capacity. I don’t think a well filled T-bag should be hanging there and if you have a rack you could probably do better in terms of weight and ease to either buy a rack bag or find a good sized bag that you can strap to the rack. The T-bag is the wrong shape for the rack and has all that weighty frame inside doing no work. Or you could underfill the T-bag and use it on the front, quite a lot of people use C-bags on S-bars with minor disruption to the cables and a T-bag that is not packed to its full height would work the same way, In combination with a rack bag that would give the best capacity with reasonable weight, unless you need to have both bags at the other end of the journey. The S/C-bag saddlebag is mainly for when you need the capacity of the T-bag for the journey but the convenience of the smaller bag at your destination. It works but it’s a bit of a trick to get the heel clearance OK and prevent the rear bag from swinging about. Thanks for sharing this innovative solution. By the way, what model and year is your Brompton? Based on the sticker and the crank set it looks like an early 1990’s? A lovely bike! I have an old yellow and black m3l, and a newer (2011) black M6L. See http://capetownbrompton.tumblr.com for some pictures. Thanks again for the great post! Hi Dion, it’s a 2013 bike but what misleads you is that the cranks are non-standard. They came with the Schlumpf Mountain Drive. I don’t use that bike at present as I have a newer Brompton but if you check more recent posts you’ll see it has a new life ahead of it.